If you're after some properly old-fashioned drum sounds, for whatever musical purpose, these highly playable, sonically authentic kits are the real deal. Not suited to all tastes. One of the best things about the rise of the ROMpler is the access it gives us all to rare, expensive or vintage real-world instruments that we'd never otherwise be able to use in our own productions. 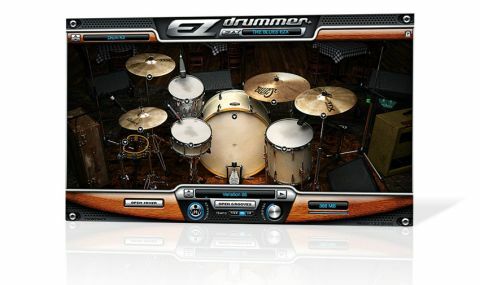 With The Blues EZX, Toontrack have dug up an old classic and an even older curio to add to their ever-expanding range of drum kits for EZdrummer and Superior 2: a 70s Gretsch and a 40s calfskinned Swedish Levin kit. "The Levin sounds wonderfully dusty, while the Gretsch captures the magic of that revered American marque well"
The Levin, with its massive 28" kick drum, sounds wonderfully dusty, dry and jazzy, while the Gretsch captures the magic of that revered American marque well - think heavy kick and bouncy toms. Rather disappointingly, though, the two headlining names only actually fill the kick, rack tom and floor tom slots - the available snares to go with them are a 14"x5.5" 60s Slingerland Radio King, a 14"x5.5" 60s Premier wood with a calfskin head, and a 30s 14"x6.5" Premier brass. While these might leave one feeling slightly deceived on first launch, they prove to be a perfectly complimentary trio of tubs that sit alongside their neighbours well. Oh, how we'd love to have seen a Leedy in there, too - we'd cheerfully have given up the superfluous Suitcase kick drum option for it. The cymbal selection is dominated by 60s Zildjians, including wicked 10" and 12" splashes, an 18" crash and a 20" riveted sizzle ride. On a more modern tip, a pair of 14" Zildjian New Beat hats, a pair of Sabian HH crashes and a 16" Paiste crash complete the metalwork. A pair of calfskin Grover tambourines are also on-hand for light percussion duties. The usual selection of MIDI files are this time performed (very well indeed) by Hans Lindbäck, covering a range of suitably old-school styles and divided up into songs and their constituent parts (verse, chorus, fills, etc). The Blues is one of Toontrack's more niche EZXs, with a decidedly retro feel that won't be to everyone's taste, but in the right hands this is a solid, authentic and enjoyable addition to the range.